Sticky Asian chicken thighs is a one pan healthy weeknight dinner recipe that is simple and quick to make for your kids. This stovetop version uses skinless, boneless thighs which are coated in a finger licking good homemade sticky sauce. Blot the chicken with paper towel and pierce them with the tip of a sharp knife. This helps the sauce absorb into the chicken, and speeds up the cooking process. Heat the oil in a 12 inch skillet set over medium-high heat. Once the oil is shimmering, place the chicken thighs in the skillet smooth side down. Be careful to avoid overcrowding. Sear the chicken for 7 1/2 minutes each side, until the chicken is crispy, golden, and has an internal temperature of 165 F on a meat thermometer. After a couple minutes of cooking, turn the heat down to medium to prevent over-browning. Remove the chicken from the skillet and place on a large plate. Drain the fat and scrape off any browned bits from the skillet, then use a paper towel to wipe out the extra fat. Whisk the sauce ingredients in a bowl, then pour into the skillet and set over medium high heat. Cover and bring the sauce to a boil, 1-2 minutes. Uncover and lower the heat, stirring constantly, until the sauce is the desired thickness, about 1-2 minutes. Add the chicken thighs back into the skillet one piece at a time and coat the chicken with the sauce. Garnish with sesame seeds and sliced green onion. Serve hot over rice. If you want extra sauce for your rice or for leftover chicken, double the sauce recipe. Leftover chicken will need additional sauce, since the meat soaks up the liquid as it sits. 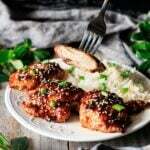 We used China Town soy sauce to calculate the nutrition facts for this recipe. It contains only 145mg of sodium per tablespoon, which is much lower than other “reduced sodium” soy sauces.